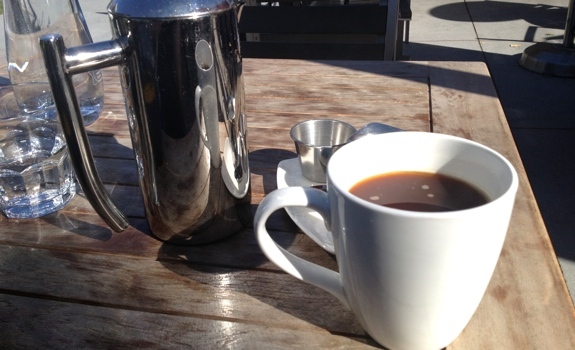 A freshly pressed pot of Phil and Sebastian coffee on the patio at Boxwood in Calgary. Bliss? Oh, yes. Remember when coffee shops sold coffee? If a bump on your noggin prompted the loss of all memory prior to May, you’d be forgiven for thinking that coffee shops sold only pastries, iced coffee, frozen hot chocolate and decaf grande mocha Frappuccinos (hold the whip). The hissing of summer lawns? Sorry, Joni, but these days it’s the deafening roar of summer blenders, plastic noise-shields be damned. Finally, after a long, hot summer, I can keep my chilly hands warm on long autumn walks through the neighbourhood, where golden leaves dangle, then tumble to the scraggly lawn below. I can relax with a newspaper on an increasingly empty café patio while my mug billows steam into the crisp air. I can fight back against the ever-darkening mornings on the train with a large paper cup from the Siren, thumbing my nose at any no-food-or-drinks sticker that hasn’t yet been picked off the wall by a bored teenager. Don’t get me wrong; I love me a good frozen hot chocolate as much as the next guy. Around NEAROF! HQ, they’ve even got a shorthand name, Fro Ho Cho, that we may have accidentally used to order a drink from a perplexed Second Cup staffer. But my point is this: Who walks into a brew pub and orders a glass of goddamned muscat? It’s time to take back our cafés, folks. 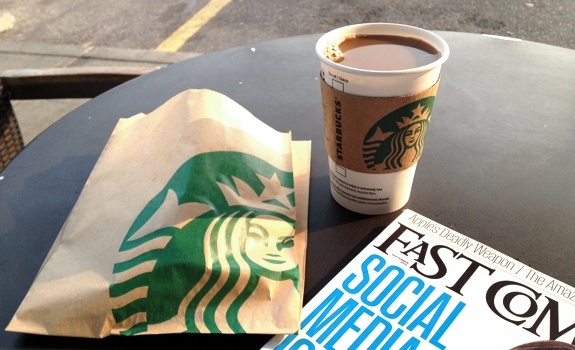 Coffee shops are about coffee, and now’s the perfect time to get reacquainted with your local. God bless autumn, where the familiar sounds of a workhorse grinder crushing beans, the wet thud of a well-thumped knockbox and the squeal of cold milk on the steaming wand return to our collective Canadian soundscape. Welcome back, old friends. A tall Anniversary Blend coffee (paired with scone and magazine) at my favourite neighbourhood Starbucks.